The Mayor of Gainsborough has paid tribute to Leah Palushi after police confirmed it was her body which was found in Dog Island Wood. Leah went missing from her home in Gainsborough on Thursday, October 22. Gainsborough Mayor, Coun Matthew Boles, said: “I was saddened to hear of the tragic death of Leah at such a young age. “Leah was a neighbour of mine and somebody I would regularly see in the street. “The death of anyone at such a young age is always a tragedy but even more so when they have young children of there own. Lincs Police confirmed on Saturday, October 31, the body found in Dog Island Wood on Tuesday, October 27, is that of Gainsborough mum Leah Palushi. The 35-year-old’s body was found five days after she went missing on Thursday, October 22. 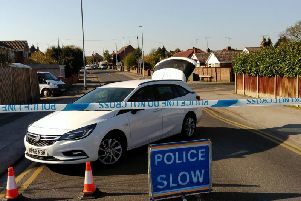 Officers were called to the scene at 9.54am and a police cordon was put in place. A file is being prepared for HM Coroner. Lincs Police are not treating the death Leah as suspicious. A 40-year-old man from the local area had been arrested but was later released without charge. Senior investigating officer, DCI Hayley Williams, said: “If you walked in or around the woods since Tuesday lunchtime please give the enquiry team a ring. Local community policing inspector, Simon Outen, said: “It’s very sad that a young woman and mum has lost her life. People have also being leaving tributes for Leah on the Gainsborough Standard’s Facebook page. Hayley Emerson said: “Leah, I still cant believe these words are real, rest in peace sweetheart. “You will be sadly missed by all of your family, friends and many others whose lives you have touched. “You will always hold a special place in my heart and I am truely devestated. “Thinking of the special moments we shared together over the years and I will treasure them forever. I wish things were different, I really do. “Thinking of your family and your two little boys. “Although they will be well cared for, there is never any thing that will live up to their mummy amd you did an amazing job at being that.